"A Skinning of Souls Part Three: Harvest of the Innocent"
The Soul Skinner is defeated. The Soul Skinner sets Omega Red after the still-free Colossus & Colonel Vazhin, who are tending to the children of the Neftelensk, left free of the Soul Skinner's control due to the painful memory of his own lost daughter. 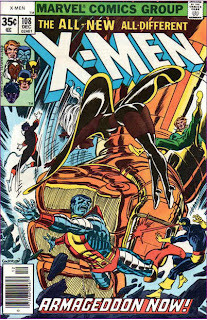 The pair spot the arrival of Russian agents, with Illyana in tow, and Colossus attacks them, which allows the Soul Skinner to get into Colossus' mind and show him his parents' deaths. 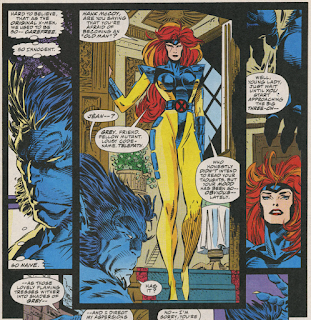 Back at the mansion, Beast discusses his recent doldrums with Jean. In Russia, an enraged Colossus attacks Vazhin, who insists he didn't intend for Colossus' parents to die. 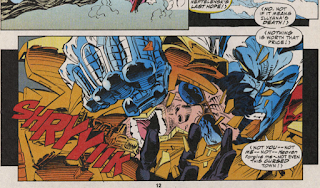 The combined grief and anger of Colossus weakens the Soul Skinner, loosening his hold on the X-Men, who attack him as he attempts to kill Illyana. 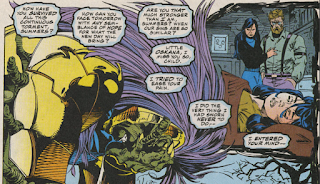 Working together, Colossus and Psylocke link the minds of the children in the village, collecting their shared innocence and injecting it into the Soul Skinner via Psylocke's psychic knife. Overwhelmed, the Soul Skinner shuts down his own mind, after which Vazhin shoots him in the head, killing him. 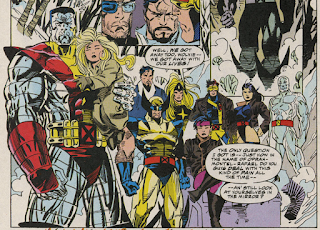 Colossus then frees Illyana, and Wolverine confirms Omega Red escaped, leaving Jubilee to wonder how the X-Men can deal with all this pain and still look at themselves in the mirror. The Soul Skinner story concludes with the Soul Skinner shot in the head by Colonel Vazhin and Illyana set to return to America with Colossus now that their parents are dead. This, of course, sets her on the path to dying of the Legacy Virus, which has clearly already been planned behind-the-scenes at this sage. Beast discusses his recent ennui with Jean, and says that he is approaching thirty, thus providing a rough age for the original X-Men at this point in time (with Cyclops, Jean and Archangel also likely near thirty and Iceman, the youngest of the original five, a year or two away). 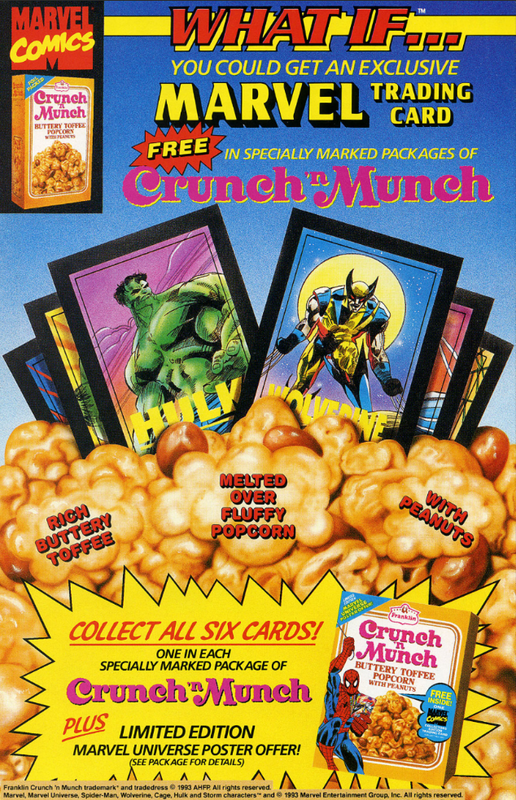 It mostly works, in a general sense (ie if the original X-Men are approaching thirty, then X-Force/the old New Mutants can be in their late teens/early twenties, while the upcoming Generation X students can be in their teens), though as with any and all dates and ages in the constantly-expanding, timeline-sliding Marvel Universe, it's best not to think about too hard or specifically. Omega Red unceremoniously disappears after the first few pages of this issue, being sent to find the Colossus & Vazhin by Soul Skinner and then never seen again, with Wolverine searching for him (off panel) only to confirm his escape. He'll next appear in an Iron Man story, and we'll next see him in Cable's solo series. There's a gaggle of inkers on this issue, suggesting some kind of deadline problem. 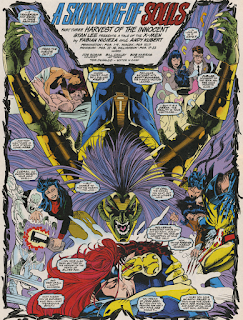 As the Soul Skinner "skins" the minds of the X-Men, we get a montage showing their various desires/fears, including Psylocke & Cyclops in bed together, Jubilee with her parents, Iceman being melted by Opal, and Wolverine being disemboweled by a clawed Silver Fox. It's revealed this issue that the Soul Skinner's wife was a Flagwatch agent assigned to him, and that this revelation, following the death of his daughter (and the subsequent follow along that his wife didn't call on the resources of the Russian government to try to save their daughter), is what pushed the Soul Skinner over the edge. None of which really matters, since Soul Skinner never appears again, but does continue the parallels between Soul Skinner and Colossus/Illyana nicely. 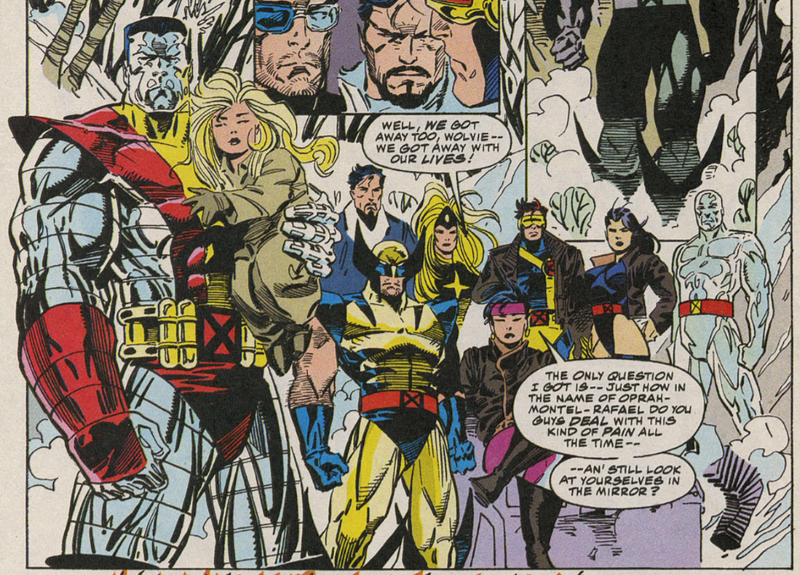 Colossus declares that nothing is worth Illyana's death, though he does give the notion of sacrificing her for the greater good some thought later in the issue, which in turn, fills him with more angst. Jubilee invokes a holy trinity comprised of Oprah, Montel (Williams) and (Sally-Jesse) Raphael. 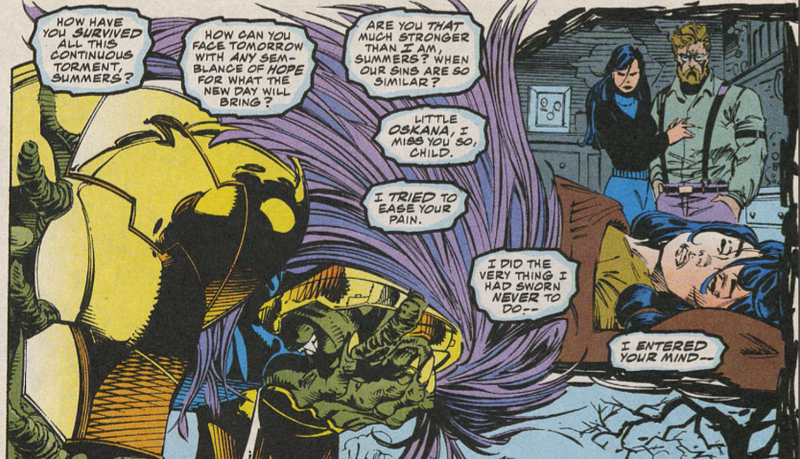 Soul Skinner basically asks how it's possible that Cyclops has survived in the face of all his angst. Rogue and Gambit continue to flirt up a storm, with a still-blind Rogue gaining the upper hand on Gambit as she flies them through the air. 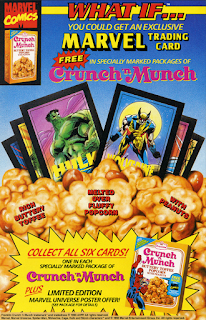 Even Crunch 'n' Munch is getting in on the collectible trading card game at this point. The Soul Skinner storyline comes to a close, with Illyana on her way back to America and the Soul Skinner defeated by the power of angst before being unceremoniously shot in the head, which explains, in part, why he's made no subsequent appearances (it also doesn't help that the Soul Skinner is, at best, the fourth most interesting thing about this story). 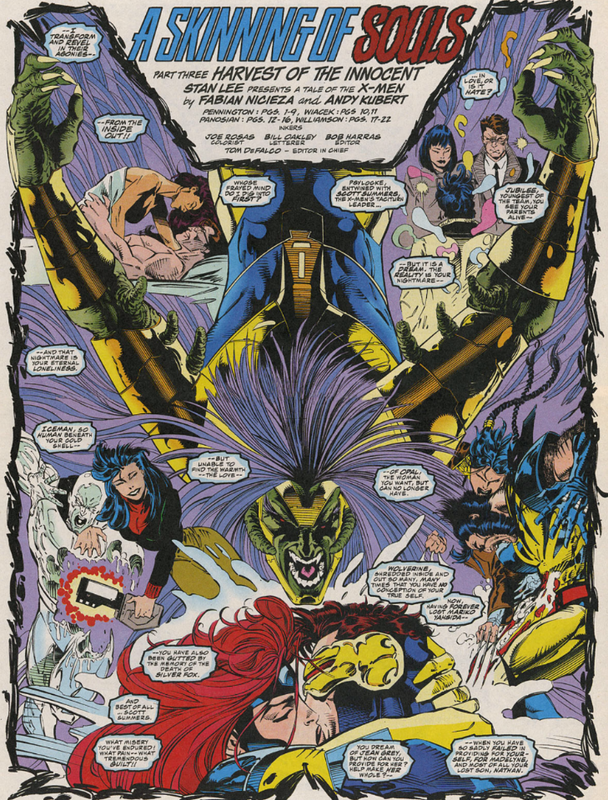 This has always felt like something of a forgotten story arc: until recently, it was never collected in trade, it falls between the rather high-profile "X-Cutioner's Song" and the (botched) attempts at expanding on Psylocke's transformation, which in turn lead to a bunch of "Fatal Attractions" stuff, so it's surrounded on all sides by bigger and/or more interesting things, and it suffers from featuring a pair of underwhelming villains, first in the Soul Skinner and then in Omega Red, arguably the marquee villain of the solo Jim Lee run, making his first appearance outside his introductory story and doing nothing with it, the beginning of a handful of appearances that make it clear the character really doesn't have much to offer beyond his first Lee-drawn appearances. It also doesn't help that the most notable things about this story are simply setup for later, bigger stories. Colossus' parents are killed, but that's just about pushing Colossus closer to the edge and getting Illyana back in the mansion - which, in turn, is setting up a bigger story for that character down the road, one which overwhelms the events of this story and will push Colossus over the edge. 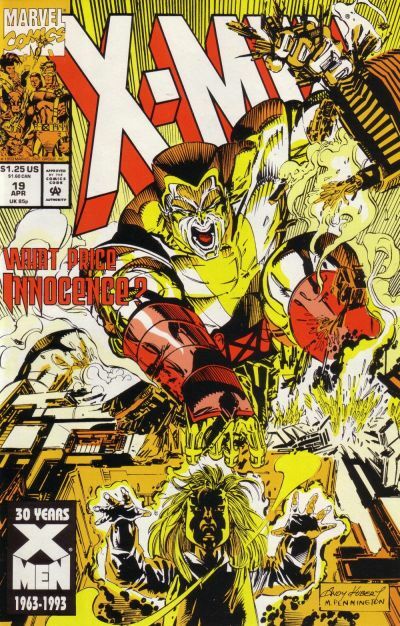 Ultimately, anything about this story which is interesting is on the margins - the changes for Colossus, setting up Revanche, Cyclops' continued angst over Cable, even Beast's quarter/mid-life crisis - leaving the central narrative to fend for itself (and failing) with an uninspiring villain and the most notable events more in service to latter stories than the immediate ones. This isn't a bad story, by any means, just a rather dull one, and if it is, in general, forgotten and overlooked, it's mostly with good reason. Tomorrow, Graymalkin 'splodes in X-Force #21. Friday, Phoenix returns in Excalibur #64. Next week, Uncanny X-Men hits #300! "Soul Skinner basically asks how it's possible that Cyclops has survived in the face of all his angst." I always liked that bit. Yes, Cyclops has been through so, so much, but he just keeps on ticking. There's a great line in an upcoming issue where Nicieza hits on it again, with narration stating that Cyclops welcomes pain like a comforting blanket. It's basically the only way he knows how to live. There's an implication that Betsy has ulterior motives for her interest in Scott- the Skinner asks if Betsy is linked to Scott in love- or hate? Unfortunately, this is never explained. This issue mentions how Scott failed to provide for Maddie- a rare admission in this period. Hmm, I wonder if the bit about Psyclocke hating Cyclops was going to tie into Nicieza's Revanche storyline somehow, before he had to alter it? I don’t know whether to make the band name / first album joke or the “Darmok” joke, but I love it either way. I don't know. The story almost gets elevated a bit in retrospect by the fact that it's a forgotten one-off villain. At least one character in Marvel Universe has had definite story arc, without S. Skinner ever being brought back just for some more angst to be (re-)milked of him. Ironic almost. I've been binging on Defenders lately, not least because the hasty Darkstar/Presence appearance in the first part of the story, and because the Marvel 90's was an experiment in re-hashing the Marvel 70's, I have a vague feeling that their appearance wasn't by mere accident, because the story brings to the fore the Soviet-Russian government shenanigin again like with Sergei/Presence back then, and Russian superfolks (Omega Red this time) being sent to the site and Mother Russia having use for her mutant children not unlike with Ursa Major and Vanguard in their DEFENDERS backstory. Kurt Busiek used the Presence towards the tail end of his AVENGERS run in the late 90s, and I always thought that was the first place I'd encountered the character. Until I re-read issue #17 years later and realized he was used (sort of) in this story. There's apparently also an early 90's Quasar not-bad story that continues the Presence/Red Guardian shenanigans from where THE DEFENDERS left them. I don't know if someone wrote that, but I think Beast turning thirty is a metacommentary about X-Men's time of publication. "I don't know. The story almost gets elevated a bit in retrospect by the fact that it's a forgotten one-off villain. At least one character in Marvel Universe has had definite story arc, without S. Skinner ever being brought back just for some more angst to be (re-)milked of him. " I remember this story looking interesting to me when I skimmed it on the racks, mainly because I always liked Colossus when they explored his love for his Russian homeland. And I always thought Vazhin was cool, because the Arcade story where his doppelganger first appeared was my first X-Men comic. But ... killing off his parents? Ugh. This after killing off the Hellions and Mariko and who all else ... It was so transparent even to teenage me that it was deck-clearing dressed up as drama, and as such the drama always felt cheap and hollow.